Open hardware helps sort out many issues that hamper the advance of robotics in India — the lack of advanced components, insufficient know-how to patch these together into finished products, the high cost of parts and platforms, and so on. A touch of open source could be the magical boost that the Indian robotics community needs. Whenever you speak to robotics enthusiasts in India, they are sure to mention one or all of the following problems that stand in their way: the dearth of low-cost components, the lack of affordable but high-quality finished products, insufficient knowledge to identify the right components for an application to put them together efficiently, scarce support for complex products, and so on. We set out to explore whether open source hardware could solve some or all of these problems, and were in for a pleasant surprise. Several members of the community felt it could certainly help, not only to sort out the existing problems, but also to improve the robotics scene in India in many other ways. The robotics community faces different problems at different levels. Students, for example, seem to be affected by the unavailability of components. 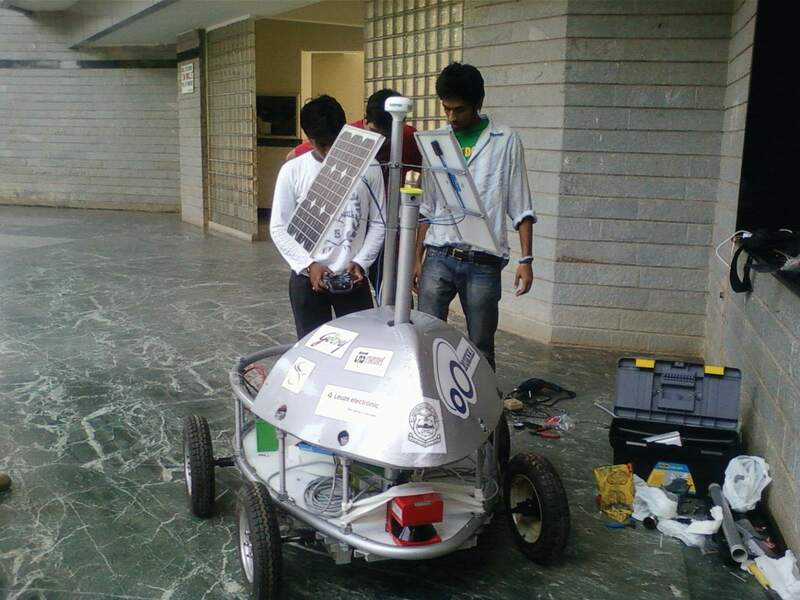 Praveen Pitchai is a member of RoboMSR, a group of robotics enthusiasts who are being mentored by Dr K G Srinivasa at the M S Ramaiah Institute of Technology, Bengaluru. On the other hand, Fahad Azad, managing partner of Robosoft Systems, feels that the lack of components by itself is not the main problem. “It has never been only the lack of components in most cases, but also the inability to identify the components required in an application. Even when the components are identified, they are out of reach due to economic factors; thus, the jugad mode kicks in,” he says. All of those contacted agree that open source hardware (OSH) or open hardware can, in some way or the other, sort out these problems. Before looking at how this could be so, we need to understand what OSH really is; it is basically the concept of open source (as popularised by open source software) applied to the design and development of hardware components. Open hardware is not free-of-cost hardware! It merely refers to hardware wherein the underlying technology or building blocks — the design and software — are also available to the user. That implies that design elements such as mechanical drawings, schematics, bill of materials, printed circuit board (PCB) layout data, hardware design language (HDL) source code and integrated circuit (IC) layout data, along with the software drivers and libraries, are all openly published and shared with others under open source licenses. This enables engineers to use the hardware better, to embed it in other products, to customise it to their specific needs, manufacture modified or enhanced components, improve the design and share it back with the community of users and developers, and so on, as permitted by the licenses used. This model of hardware design and development appears to offer several benefits for the robotics community. “Researchers have long been used to cranking out code in the morning and having a working prototype by the afternoon, but have been frustrated that they can’t do the same with hardware. That’s starting to change, and fast, driven in part by robotics enthusiasts and do-it-yourself types who are utilising a new generation of OSH platforms and rapid fabrication tools. We are starting to realise that we can control a laser cutter like a printer, and also a precision range-finder. That means the promise of creating new physical devices as quickly as Web apps are written, is just around the corner,” says Shekar N H, another RoboMSR member. Let us look at just some of the ways in which open source could help advance developments in the robotics domain. Reduced cost and time-to-market: “While open source software has helped in developing numerous innovative products and gadgets, in most cases, it has now reached a bottleneck due to the lack of similar platforms for hardware. Progress in robotics especially, depends on the development of cost-effective, innovative solutions using new-generation OSH platforms and rapid fabrication tools,” says T Jayakrishnan, director and country manager, Energid Robotics and Machine Vision. OSH, with its characteristic features of flexibility, modularity and reusability, would help do just that. The wheel never needs to be reinvented, and you can easily use open source intellectual property (IP) as building blocks for a new project. This kind of reuse reduces cost, and also speeds up the process of converting an idea into a finished product — especially the initial phases of feasibility analysis and proof-of-concept demonstration. It also fosters research and learning with little investment, and encourages innovation. Community support: One individual can never do as much as a community! So, it is always better to open up a system for a whole community to develop and improve. “Making hardware open-source helps foster a huge support community. If someone has already done something, users just have to plug-and-play, or contribute to the system and help it grow bigger and bigger,” says Azad. Common standards: A natural consequence of community development is the evolution of common standards, making it easy for other systems to integrate seamlessly with an open-source technology. Low-cost manufacturing: OSH makes not just component designs available, but also the knowledge required to convert raw components into good-quality finished products. This enables not just innovation and further improvement of product designs, but also low-cost manufacturing. People in any corner of the world, who think they have the resources and bandwidth to manufacture a product, can seek the required permissions and manufacture it based on the open-source designs and procedures. This kind of localised manufacturing would help bring down the cost of the components in various geographies. Easy hardware-software integration: It has also been found that due to the availability of complete specifications and the modular nature of OSH, it is easier to integrate hardware and software. Since no robotics project is complete, or even possible, without complex software systems today, this is a major benefit. A multi-disciplinary approach: A low-cost, Web-based community development model encourages many others to contribute. “When it is free, people are more willing to experiment with, and try out, something that they would not ordinarily have done. OSH allows absolutely anyone and everyone to contribute — even those who may not be engineers. If they have free access to some hardware, then even a biologist or an economist can chip in. So, OSH encourages the fusion of various streams of knowledge,” says de Sa. A lot of well-known robots have been, and are being built using OSH. AcYut, BITS-Pilani’s humanoid robot that went on to win the RoboGames last year, is a brilliant example. The RobotCub project, funded by the European Commission to build iCub, a toddler-like humanoid robot, is also based on an open framework. Spykee, the network-controllable mobile robotic toy, is also advertised as an open-source robot, which can be integrated with other projects or modified to a user’s needs. E-puck, the education robot originally developed at the École Polytechnique Fédérale de Lausanne, Switzerland, for micro-engineering education, is also a classic piece of open engineering. The hardware designs as well as the on-board software of the seven-centimetre-tall differential-wheeled mobile robot are open source, and it is being built and sold by several companies now. The Humanoid Robot project of Sweden is another example of open source, which has contributed greatly to the development of robot learning techniques. Virginia Tech’s Dynamic Anthropomorphic Robot with Intelligence–Open Platform (DARwIN-OP) is another recent example of an open-platform miniature humanoid robot that’s been developed for research, education and outreach. Users are encouraged to modify and use both the hardware and software aspects of DARwIN-OP. CAD files for all its parts, and instruction manuals for fabrication and assembly are available for free on the university’s website, and various software implementations are possible using C++, Python, LabVIEW, MATLAB, etc. The platform features advanced computational power, sophisticated sensors, a high payload capacity and dynamic motion ability. All of Willow Garage’s projects, including PR2 and Turtlebot, are also typical open source examples. The robot operating system, ROS; the open-source computer vision libraries for real-time perception, called OpenCV; other components published by Stanford University’s Artificial Intelligence Laboratory and Steve Cousins’ Willow Garage have become quite popular in the robotics field. Gostai, a French company that makes surveillance and telepresence robots marketed as part of the Jazz brand of products, is another open-source success story. With its tagline “Robotics for Everyone”, the company has not only demonstrated the benefits of using open components, but given back to the community by fully open-sourcing its prized piece of technology, Urbi — an open-source software platform to control robots. One of the biggest examples of OSH, which is widely used by the robotics community in India, is Arduino — an open-source electronics prototyping platform based on flexible, easy-to-use hardware and software. The Arduino board can receive inputs from a variety of sensors, and in turn control external factors like lights, motors and actuators. Arduino’s reference designs are available on the company’s website as CAD files, and can be modified to suit the user’s needs. The board itself can either be bought assembled or built by the user based on the designs. The microcontroller on the board is programmed using the Arduino programming language and the Arduino development environment, all of which can be downloaded for free from the Arduino website. “The Arduino platform is creating a revolution in the field of robotics, as it is simple to use. The board is also flexible, in the sense that there can be different voltages taken from the same board, there can be digital signals and analogue signals given as inputs, the size of the microcontroller can vary from being an Atmega8 to an Atmega2560, and so on. Plus, there are various interfaces for different hardware components, from the very basic to the more complex. There are also various types of boards available for different utilities. There are many projects that are being carried out with the help of this board, for hobbyists as well as for researchers,” says Pitchai. Another popularly used platform in India is the Beagle Board, an interesting piece of OSH developed by a skilled community including several employees of Texas Instruments (TI). The Beagle Board is a low-cost, fan-less, single-board computer based on low-power TI processors, featuring the ARM Cortex-A8. It is known for being light but highly expandable. Jayakrishnan says that Energid uses the Beagle Board for remote-control video processing in some of its products. BITS-Pilani’s Centre for Robotics and Intelligent Systems (CRIS) has developed microcontroller hardware for use by students in their courses. “All designs, software and source code are released under the Creative Commons Attribution Share-Alike (India) license for use by students of BITS, and anyone else,” says de Sa. A lot of open-source software is also used in robotics. We have already mentioned some software platforms such as ROS, OpenCV and Urbi. OpenRAVE is another open-source, cross-platform, plugin-based robot planning architecture that serves all planning and execution purposes. It includes services like collision detection, robot kinematics, physics, robot controls, and a network scripting environment. This was developed at Carnegie Mellon University. OpenJAUS and RI-JAUS software development kits are used in the joint architecture for unmanned systems, and include several useful code components in C++, as well as software to standardise an unmanned system automatically. Orocos is an open-source tool-chain for real-time robotics that covers all aspects of robot control. Orca is an open-source framework for developing component-based robotic systems. Player is another tool to create software architectures for robotics and sensor systems, and also provides the simulation platforms, Stage and Gazebo, for testing the tools. The Rossum Project is an attempt to collect, develop and distribute software for robotics applications, and is a great starting point for those looking for open-source tools for their robotic projects. It appears the open-source trend in robotics is set to grow stronger in the future, and with it, the advancements in robotics. This requires the community to give back as much as it consumes. This can be done by starting new open-source projects and uploading your designs, or by improving the hardware and software belonging to existing projects that you utilise. You can contribute CAD files for hardware components, Gerber files in the case of PCB layouts, the Initial Graphics Exchange Specification (IGES) files for mechanical components, and software code, for new and existing open-source projects. Being a nascent industry, it would be worthwhile for robotics startups to consider an open-source model for their business. This is also quite profitable, as can be seen from the success stories in the software field such as Red Hat, et al. There are tried and tested business models, specifically for OSH. These include the Forty Percent Model, the Third-Party Catch and Semi-transparent Pricing models. Read more about these here. The author is a freelance writer and hands-on mum, currently based in Singapore. She likes to write on technology, business, cuisine, culture, and the many other things that crowd her wonderful life.